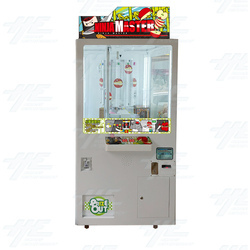 Ninja Master Prize Redemption Machine is a cutting style crane machine. Players must navigate the cutter tool up and down the cabinets rotating centrepiece and try to cut the rope attached to the prize they want. This game requires skill and perfect timing in order to line the cutting tool up with the fruits, and it bound to be an exciting challenge for all players. This game requires skill and perfect timing in order to line the cutting tool up with the fruits, and it bound to be an exciting challenge for all players.